After the joy of Brindisa, it’s marvellous to see another of my favourite London restaurants open up a little closer to home too. 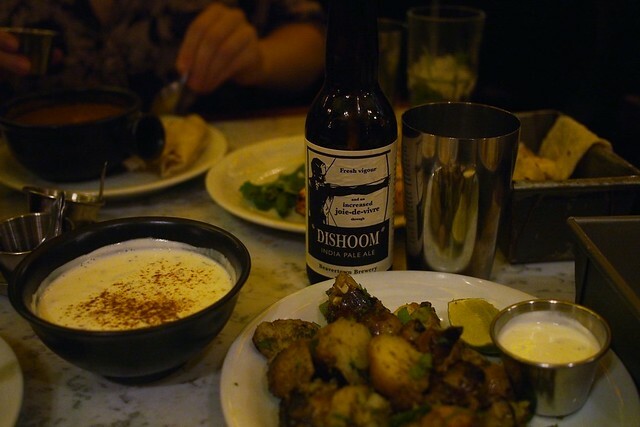 Dishoom‘s original site (blogged here) is a sweetly kitsch recreation of a Bombay cafe in Covent Garden. 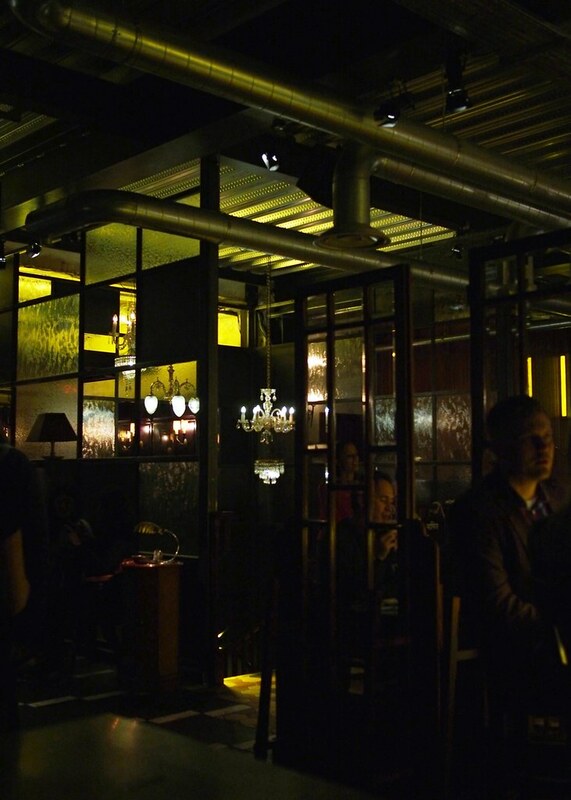 It’s nice to see that for the new site on Boundary Street, Shoreditch, they’ve sized up and gone for a more area-appropriate grunge-luxe decor. The huge two-floor warehouse space is filled with mahogany room dividers, textured vintage glass and industrial metal lighting details. We popped in on a gloomy Friday night just after their soft launch period ended. Without a booking we had a 40-minute wait for a table, but this was no hardship thanks to a cosy bar area and delicious cocktails – my chaijito was a great spicy twist on a classic mojito. Josh enjoyed a bottle of the house IPA, brewed especially for the restaurant by local Beavertown Brewery. 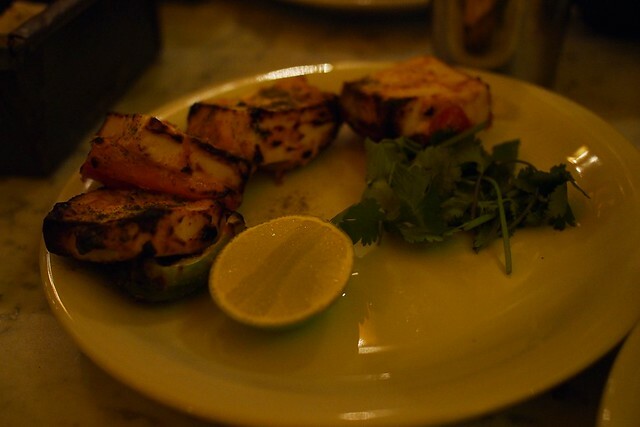 The menu is mostly grill-heavy with several marinated meat choices, plus lots of nibbly starters and some sauce-based ‘ruby murrays’ too. We’d been perusing as we drank, so ordered as soon as we were seated. The food arrived impressively quickly, complete with super tasty little chilli, coriander and chutney dips. 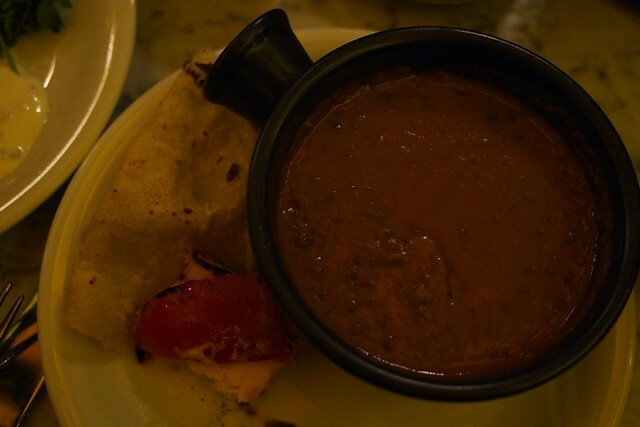 I’m a little ashamed to say that I ordered exactly the same as when I last went to the other Dishoom – I hardly ever do that but had to make an exception for paneer tikka, black dal and roti – why would you stray? It tasted just as I remembered from before: fresh, rich and deeply layered with flavour. Josh got lamb chops and fabulous gunpowder potatoes which were soft and smoky. 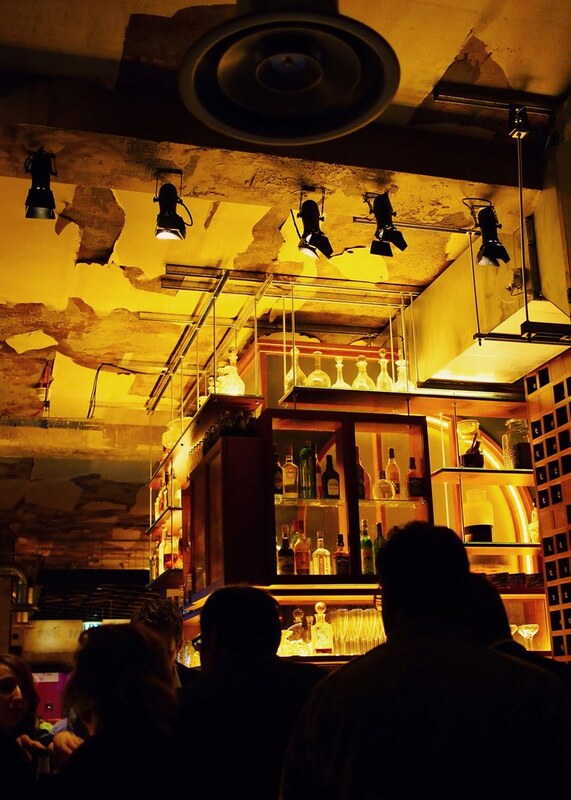 Service was a little chaotic (our credit card was temporarily lost after opening a bar tab) but given that it was the first real night after the soft launch, I forgive that – it was still efficient and friendly. I feel I’ll be back very soon. 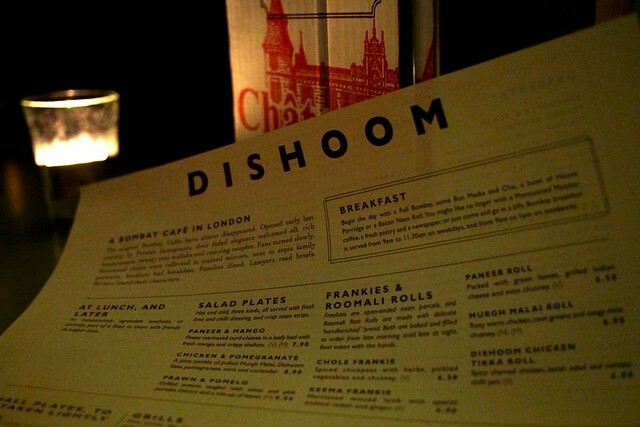 The new Dishoom Shoreditch is at 7 Boundary St, just off Shoreditch High Street. 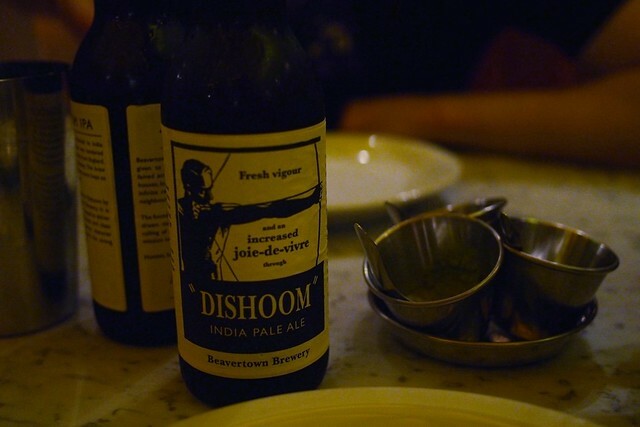 The word dishoom is supposed to be the exaggerated sound made during fight scenes in Bollywood films. The menu looks pretty faithful, but the prices are making me giggle, so expensive! I am a Dishoom mega-fan as well!